Authentic Re-production of the original Ericofon telephone in white. This working telephone has today's technology, a functioning push-button dial, with last number re-dial. The ScandiPhone is based on the unique upright phone that was introduced in Europe in the mid 1950's. Smaller and lighter than anything available at the time, the unusual one piece design was a fine example of form and function in harmony. The push button version was introduced in 1967. In 1973 the Phone was selected to be part of the New York Museum of Modern Art's Collection, in recognition of its significance as a piece of excellemt design in the 20th Century. With the minaturisation of components, the advent of designer phones became possible. One of the first examples and first ever one piece telephone was designed by Ralph Lysell and Hugo Blomberg. Production of the Ericofon started in 1957. The dial is on the under side. 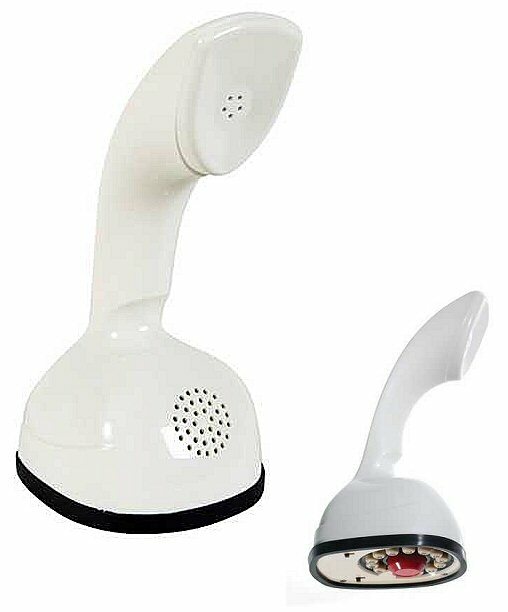 Here we present our reproduction Ericofon dial telephones, which bring the traditional Ericofon design into the 21st Century. We fit each telephone ordered with a plug that is compatible with the telephone system in the country to which the telephone is being sent. All telephones have a 12 month guarantee.